Over-engaged leaders work way too hard. Over-engaged leaders produce disengaged teams. Work to make space for others, if you’re an over-engaged leader. Love check lists. Don’t dive into problem-solving without exploring why it matters. Over-engaged leaders can’t resist quickly solving problems like squirrels can’t resist nuts. Lack curiosity. Curiosity dies when quick minded leaders give quick answers. Over-engaged leaders answer questions, but seldom ask them. Seek options before choosing solutions. Neglect emotional considerations. Ask yourself how people feel when when you’re in the room? Energized? Nervous? Respected? Like cogs? Step in quickly. When you step in quickly, others step back. 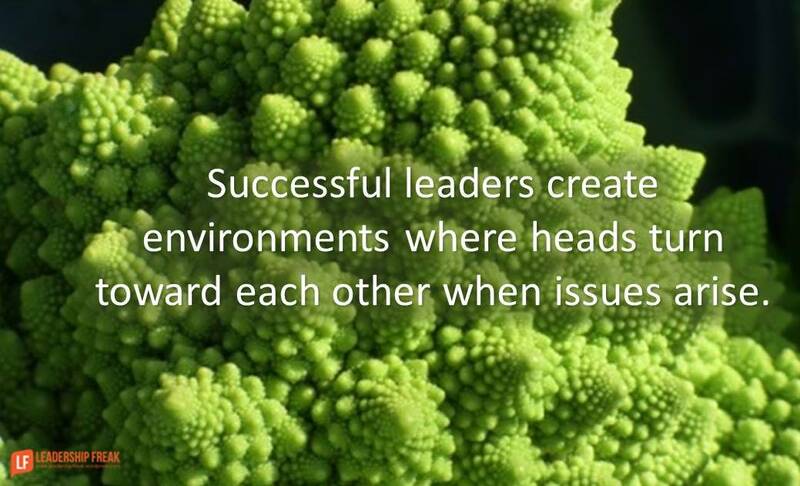 Successful leaders create environments where heads turn toward each other when issues arise. Leaders are less central. Heads turn toward each other rather than the head of the table. Others step in. Engagement goes down when everything centers on one leader. Leaders loosen their grip so others can strengthen theirs. Solutions are developed collaboratively not before the meeting. Don’t bring a pre-ordained solution to a meeting where you expect collaboration. Results and responsibilities are clearly known and publicly shared. You eliminate space for engagement when you answer all the questions and bring pre-planned solutions to the meeting. People touched by the work, participate in planning the work. Team members feel responsible to each other. Letting the team down is discussed publicly by the team. What am I doing that hinders you from turning toward each other to seize this opportunity? How might I step back without making it seem that I don’t care? How might we create an environment where you turn toward each other to address issues, concerns, and opportunities? How might leaders create environements where heads turn toward each other for solutions? I started reading this thinking, “can you ever be too engaged as a leader”. But then as I read on, it makes perfect sense that leaders should be less at the head of the table and rather engage the entire team. Engagement is key to prevent boredom and lack of enthusiasm. Thanks Mitra. I think your expectations are pretty normal. Leaders expand their potential and the potential of the team when engagement goes up. It takes courage to encourage people to turn toward each others. Too often leaders feel they have to make the decisions and be seen to solve the problems. Perhaps a carry over from what made them successful earlier in their career. Engaging and leveraging the team to solve problems can be a hard skill to acquire but it pays dividends in so many ways. It’s a bit like teaching a man to fish vs catching the fish for him – in one way you teach the man how to survive on his own and in the other you make him dependent on you. Choosing to leverage the team means the team find the work more satisfying, grow in capability, and grow their comfort zones. It provides the leader with an opportunity to leverage their experience across so many more people through coaching and mentoring instead of doing. Doing is such a waste of a good leaders talents. Finally leveraging and engaged team also means the leader can focus more on leading … charting the course ahead and ensuring the team have what they need to deliver. A fundamental task often lost when the leader is too busy weeding the garden. This is a great article and you raise a great question – How might I step back without making it seem that I don’t care? I’ve been thinking about this a lot lately. I went from running a corporate division of 600+ people where I could step back, delegate, and let my great employees run the show to starting my own business with less than 20 employees. Currently, I am engaged in almost every detail of the business but I worry that my employees will become used to me being the center of authority. It would be interesting to write about leaders of start-up companies and how to make this transition. If the leader doesn’t step back and let others lead, the company will never grow. Would you mind if I “reblogged” your article on my website https://jonsrennie.com/? Thanks Jon. I often work with leaders who face the same challenge. Sometimes the pendulum has to swing from over involved to under involved to appropriately involved. It’s a challenge. One strategy is to simply discuss it with the employees. How might I become less involved without making it seem that I don’t care? What type of involvement do you find useful? What does it look like for you to take higher ownership in your area? What do you need from me to move forward without me? What changes about your view of yourself if you think about greater autonomy? …. Please feel free to reblog. Thanks for asking. Thanks Dan. Great thoughts. I enjoy your work!